This week I found inspiration and made two watercolor drawings. 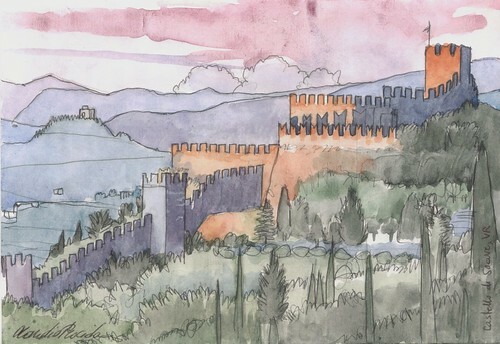 The first one is a view of the castle of Soave near Verona, in the north of Italy. 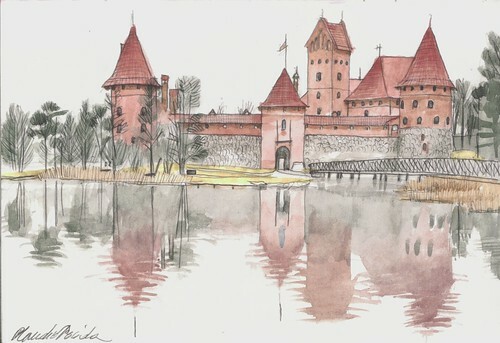 The second is the view of the castle of Trakai Island, in Lithuania. They're important for me because they mark the end of a temporary artist's block lasted a few months. I was greatly inspired by the work of Joan Ramon Farré Burzuri. I love his sketches, they're awesome. I admire his ability to give up focus on the detail to achieve a great overall picture. I envy his stroke, thick on the contours and thin in the details, and his use of the brush, and the casual drops of color that you find on the pages of his sketchbook. Antispam question:	10 + 9 = ?